McPherson Unit is located in Jackson County Arkansas. It houses over 800 female inmates in various stages of incarceration from maximum to medium custody. 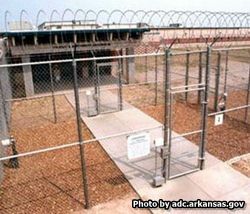 This facility is also responsible for the intake and classification of female offenders in Arkansas. .Like all facilities McPherson allows inmates to take substance abuse and treatment programs as well as education programs where inmates can earn their GED. This facility also has a life skills program aimed at helping inmates make better decisions and gives them the skills they need to successfully reintegrate with society once they are released. Parenting programs help parents to realize the importance of maintaining a stable household and break the cycle of incarceration by giving their children a better home environment. Industrial and agricultural vocational programs are also available. Visiting at McPherson Unit is on Saturdays and Sundays from 11:30am-3:30pm on a rotating schedule, so you must contact the inmate to find out which weekend, day, and hour they are allowed visitation. Inmates who are currently undergoing intake or classification may be restricted from receiving visits.